Charles Horner is a senior fellow at the neoconservative Hudson Institute, where he specializes in China, international science and technology relations, and international treaties, particularly the international sea treaty. Horner has also worked with other rightist policy groups—including the Center for Security Policy, where he served on National Security Advisory Board, and the Madison Center—and served as a diplomat and adviser in both the Ronald Reagan and George H.W. Bush administrations. In 2003 President Bush selected Horner, along with neoconservative ideologue Daniel Pipes, to join the board of directors of the U.S. Institute of Peace. Before joining the Hudson Institute, Horner was president of the Madison Center, which in 1990 merged with the Institute for Educational Affairs (IEA) to become the Madison Center for Educational Affairs (MCEA). The IEA was founded by Irving Kristol, William Simon (former Treasury Secretary for presidents Nixon and Ford and president of the Olin Foundation), while the Madison Center was founded by William Bennett. Media Transparency reports that the MCEA "provides funds for right-wing research and conservative student newspapers." MCEA not only gets its funding from Olin, but also the Scaife, Smith Richardson, and J.M. Foundations. 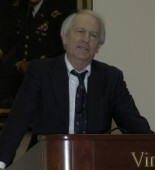 Hudson Institute, "Charles Horner," http://www.hudson.org/horner. US Institute for Peace, "Four New Members Join Board," US Institute for Peace, August/October 2003, http://web.archive.org/web/20090610074343/http://www.usip.org/peacewatch/2003/810/board.html. See, for example, Andrew S. Erickson, review of Charles Horner, Rising China and Its Postmodern Fate: Memories of Empire in a New Global Context, Naval War College Review, 63.1 (Spring 2010): 145-47. Victoria Tin-bor Hui, “Charles Horner, Rising China and Its Postmodern Fate: Memories of Empire in a New Global Context,” China Perspective, 2010/3, http://chinaperspectives.revues.org/5319. Eric Brown and Charles Horner, “Beijing's Islamic Complex,” Wall Street Journal Asia, June 3, 2010, available at http://www.hudson.org/index.cfm?fuseaction=publication_details&id=7042. Madison Center for Educational Affairs, "Madison Center for Educational Affairs," Madison Center for Educational Affairs, [no date], http://web.archive.org/web/20041211022811/http://www.mediatransparency.org/recipients/madison_center.htm.